I want to share about a book I have been excited about for a few months. Nick actually won this book in a drawing a few years ago and our copy is signed by the author - cool, huh?! At one point, I read it every night searching for new foods we could try with great health benefits. I grew up mostly thinking food was about taste and making sure you ate 3 meals a day. I've been learning in the past year about how food is SO much more than that. Almonds: These nutritious nuggets are a good source of protein, fiber, vitamin E, and a variety of antioxidants. They can help with weight control and heart health, and may reduce the risk of Alzheimer's disease. Barley: This whole grain is a rich source of vitamin E, fiber, B vitamins, and a wealth of antioxidants. Barley contains beta-glucan, which can help reduce the risk of heart disease. Quinoa: This is an ancient grain high in protein, fiber, iron, zinc, vitamin E, and selenium. It can help control your weight and help lower your risk for heart disease and diabetes. Coffee: In moderate doses, coffee may reduce the risk of type 2 diabetes, improve mood and memory, and, for men, reduce the risk of Parkinson's disease. Eggs: They are low in calories (75 per egg), an excellent source of high-quality protein, and rich in folate, choline, and iron. They can play a role in eye health and weight management -- an egg at breakfast helps to curb appetite. Grapes: They're rich in vitamin C, potassium and quercetin. Preliminary studies have shown that quercetin may boost the immune system. Kale: This super-healthy green veggie has vitamins A, C, potassium, lutein, and zeaxathan, which can help reduce the incidence of certain cancers and macular degeneration. Ginger: This spice with anti-inflammatory properties may help lesson arthritis pain. It also quells upset stomachs, nausea, and motion sickness. Pecans: These nuts are rich in gamma tocopherol, a type of vitamin E, as well as a rich source of antioxidants. Sweet potatoes: They're rich in vitamin A and C, high in fiber, and naturally sweet. Sweet potatoes are also an excellent source of lycopene which may fight heart disease, and breast and prostate cancer. Olive oil: This Mediterranean diet staple is rich in heart-healthy monounsaturated fats and plant compounds that have anti-inflammatory action to fight heart disease and cancer. There are many other great foods with surprising health benefits in this book. 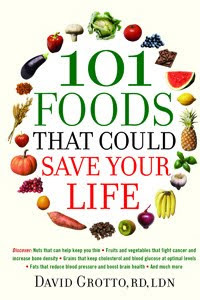 Here is a link to the author's website for the book which has great video clips about some of these powerful foods. In the book, he talks about the origin of the food, preparation/storage tips as well as the life saving or life changing health benefits. Some of the foods help prevent heart disease, stroke, obesity, diabetes, hypertension and certain cancers. It's really an exciting book to read and made me anxious to get to the grocery store and try them out. Check your local library, you may be able to test out this great book for free or at least flip through the pages at a book store nearby. The index in the back can be searched by health ailment too which is super helpful if there is a specific pain you're looking to eliminate. It's worth giving it a shot in my opinion!